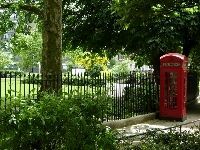 Situated in the centre of London, Bloomsbury offers a series of attractions. To name a few, the British Museum and the University of London, which is why there are so many students in the area. Many prominent people, from economists to writers, have lived in Bloomsbury's Georgian houses. Russell Square is one the biggest in central London and has a small garden in its centre. The area is residential and reasonably quiet, but many of the terrace houses are now offices or have been taken over by the university. It is no longer what it was in the days when it was inhabited by the 20th century group of writers and artists who became known as the Bloomsbury group. The underground is on the Piccadilly line. There is only pay parking and as the area is inside the Congestion Zone anyone driving into or through the area by car has to pay a fee. There is a shopping centre and numerous good book and print shops.